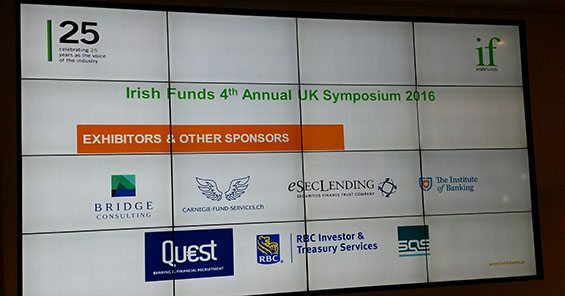 Quest Recruitment were proud sponsors of the Irish Funds 4th Annual UK Symposium in London last Friday the 25th of November. It was a great success with over 600 delegates in attendance. This annual event provides a fantastic opportunity for senior participants in the Irish and UK Investment funds industry to network and discuss many key issues within the International Funds Industry. M.C and Introductions were delivered by Alan Cuddihy – Director, Audit – Investment Management, Deloitte, while the keynote address was presented by Eoghan Murphy, Minister of State (special responsibility for Financial Services, eGovernment & Public Procurement). In attendance from Quest Recruitment included Garth McKeown Managing Partner, Larry McCowen Managing Partner, Louise Delaney Senior Executive Consultant and Alan Keogh Fintech Recruitment Business Leader.